Kingcamp quick up beach tent is perfect to be used for picnic, camping, beach, patio parties, fishing, and more! With Pre-assembled aluminum poles system the tent is easy to open or fold in seconds. With strength aluminum easy-up scaffolds, 4 sand pockets and 8 Steel nails, the tent is stable and firmly in windy conditions. Internal pockets are used to store personal items. UPF 50+ sun protection, semi-closed structure with 3 large windows for ventilation. Sloping forehead provides more coverage area of Anti-UV effects. Oversized floor can seal the door for privacy, use it as a changing room. The weight is 6.4 lbs and the size has 32 x 6 x 6 inches after folded so tent is portable and light enough to be carried like a small luggage on a trip. Portable zipper carry bag with handles is easy for transportation and storage. ❤QUICK SET UP with pre-assembled aluminum poles system. Innovative pop-up design- no assembly required. The beach tent has internal pockets to store personal items and hooks for hanging. 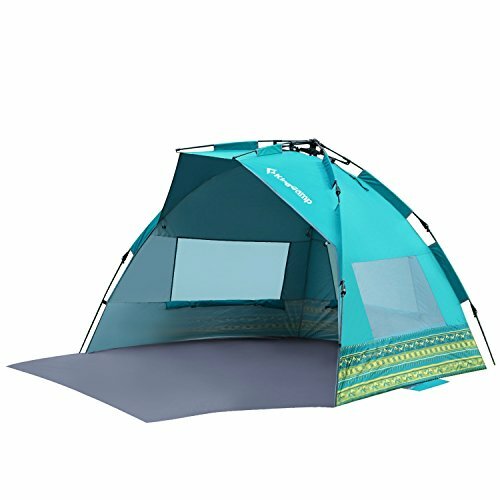 ❤Lightweight, compact beach tent provides protection from the sun, rain and wind for all outdoor activities, UPF 50+ sun protection and 3 large windows for ventilation. The beach tent is made from 190T breathable polyester and PU coating fabric(waterproof rated:1500 mm).